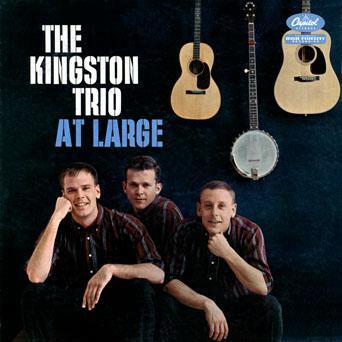 Before The Beatles…there was The Kingston Trio! 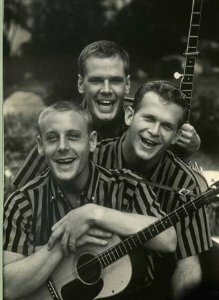 The Trio of Dave Guard, Nick Reynolds and Bob Shane were the most recognized act of the initial folk boom of the late 1950s causing a sensation throughout college campuses. Their brand of exuberantly sung folk songs mingled with a healthy dose of good natured “aw-shucks” humor offered pure entertainment and insured them a place on the charts and on concert stages. Their hits included “Tom Dooley,” “The M.T.A.,” “The Tijuana Jail,” “Where Have All The Flowers Gone,” ”A Worried Man,” plus many others. I was introduced to the music of The Kingston Trio by my parents, with the group’s Greatest Hits album which was a staple of their record collection. They were also fans of The Brother’s Four and had a Columbia album called All Star Hootenanny that gave me my first taste at a very young age of Bob Dylan, Pete Seeger, The Clancy Brothers and Johnny Cash all in one place. I’ve also had the honor and pleasure of compiling several Kingston Trio collections during my music career while working for Time Life Music and Reader’s Digest Music back in the 1990s. For Reader’s Digest, I compiled a 60-track, 3 CD set called The Kingston Trio: Their Greatest Hits & Finest Performances. At the time of its release, it was the most comprehensive Kingston Trio collection available on the market. It was also one of Reader’s Digest’s most popular single artist collections and was kept in print for many years. At Time Life, I compiled a 30-track, 2 CD collection of their greatest hits for a TV-sold package called The Very Best Of The Kingston Trio, and also created a second 30-track collection of deeper cuts for an upsell called Trio Treasures & Folk Favorites. I also spent some time consulting for a great Chicago folk record label called Folk Era which is run by Allan Shaw, who is one of the world’s great authorities on The Kingston Trio and the music of the Folk Era. The label is also the home of the Rediscover Music Catalog which includes a well thought out selection of folk music you won’t find elsewhere. During my time working with Folk Era, I was introduced to original Trio member Bob Shane and John Stewart, who replaced Dave Guard in the trio in 1961 and remained a member through 1967. John Stewart was also best remembered for writing The Monkees’ hit “Daydream Believer” and his own classic 1971 album California Bloodlines. Today’s Song Of the Day was originally from the group’s 1959 fourth album At Large. The group was at the absolute height of their popularity in 1959 placing four consecutive albums into the top ten of the Billboard album charts throughout the year. The song has been covered by numerous artists including Pete Seeger, Joan Baez, Bob Gibson, Dave Van Ronk, Harry Belafonte, Peter Paul & Mary, and many others. Over the years, it has also become closely associated with Lindsey Buckingham who recorded it for his album From The Cradle. Before performing the song in concert, Buckingham regularly pays homage to the influence The Kingston Trio has had on his career. The At Large album was the first Trio studio album that the group really began to gel instrumentally with each other. The inclusion of David “Buck” Wheat on double bass and occasional guitar filled out their sound. Wheat also assisted with arrangements and remained part of the outfit through the end of 1961. The album won a 1960 Grammy Award for Best Ethnic or Traditional Folk Recording and it was also nominated in the “Best Vocal Group or Chorus” category. It was certified Gold for sales of 1,000,000 units in 1961. Several other Kingston Classics also came from the At Large album including their #15 hit “M.T.A.,” which is one of their most beloved recordings and “Remember The Alamo,” which was considered and rejected for use in the John Wayne film, The Alamo. The Trio’s recording of “Scarlet Ribbons (For Her Hair)” was originally made popular by Harry Belafonte a few years before The Trio took it on and became a concert staple and another of the group’s most requested songs. The #12 single, “Tijuana Jail” b/w “Oh Cindy,” was also recorded during the sessions for the album, but ultimately left off. Although touring members of The Trio still exist, the last version with original member Bob Shane stopped touring in 2004.